DBN promises a world of opportunities from entry level to Senior Management level. 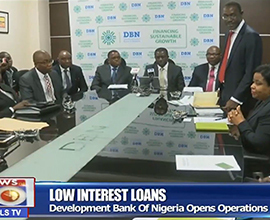 At the Development Bank of Nigeria, we provide you with the platform to achieve your goals while impacting your community. We are looking for competent and confident people who share our vision to take up these rewarding opportunities. Take the next step in your career. Our recruitment philosophy is to attract, develop, motivate and retain a cohort of highly qualified professionals designed to meet the unique challenges and goals of the Bank. In light of its specialized mandate, DBN shall treat its staff as its most important assets.